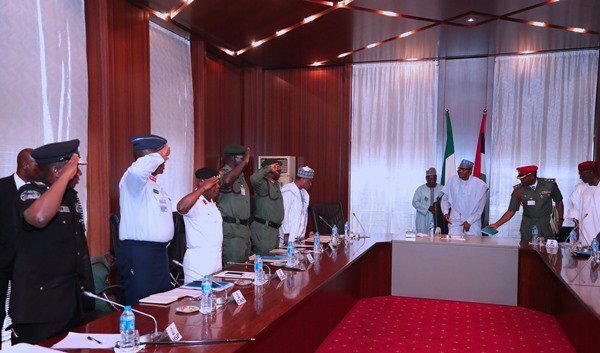 bases and killing of officers in the North-East, President Muhammadu Buhari has called all the Service Chiefs for an review session. The President has likewise sent the Minister of Defense, Brig-Gen Mansur Dan Ali (rtd), to the neighboring Republic of Chad for an earnest gathering with President Idris Deby and his defence counterpart. It was also learnt that the deterioration in the security situation on the Nigeria-Chad border has led to recent increase in the activities of Boko Haram in the area. According to The Nation, a reliable source said: “The President has called for an urgent meeting with the Service Chiefs. “Also, the families of the latest victims of Boko Haram are being identified and contacts made before a government pronouncement on the tragic attacks. One of diplomatic sources in Abuja, who did not want to be named, said: “Nigeria has a Chad problem in the Multi-National Joint Task Force (MNJTF) put together to secure the Lake Chad basin areas and repel the Boko Haram terrorism attacks against all the countries neighbouring the Lake. “Chad is believed to be having its own internal security challenges and these have reportedly led to their pulling away their own troops manning their own border around Lake Chad. “That lacuna is being exploited by the Boko Haram terrorists who go in and out of Nigeria, Niger and Cameroon to launch terrorist acts. A top military source, who spoke in confidence, said: “Most of the attacks were actually coming from Chad flank of the war against the insurgents. “The insurgents take advantage of sudden withdrawal of Chadian troops for some assignments without adequate communication.